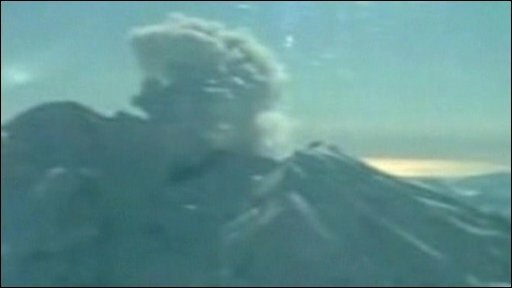 Mount Redoubt volcano in the US state of Alaska has erupted, sending a cloud of ash 15km (50,000ft) into the air. The volcano, 166km (103 miles) from Anchorage, erupted late on Sunday, with four more explosions early on Monday. Ash from the explosion has fallen on towns north of Alaska's largest city, Anchorage, but the city itself has not been affected by the eruption. Alaskan Airlines cancelled 19 flights because of the ash, which can cause damage to jet engines. Dozens of aircraft at the Elmendorf Air Force Base in Anchorage were being sheltered as a precaution against the falling ash. "Just kind of a light dusting," was how Dave Stricklan, a hydrometeorogical technician with the National Weather Service, described the expected ash fall. "There's going to be a very fine amount of it that's going to be suspended in the atmosphere for quite some time," he added. Volcanic ash can cause skin irritation and breathing problems. Mount Redoubt, which stands 3,100m (10,200ft) high, last erupted over a four-month period from 1989 to 1990. Scientists monitoring the area warned in late January that an eruption was likely. On Sunday, officials raised the alert level after researchers recorded increased seismic activity.